Two forces converged to initiate the PDB: 1) a small but growing collection of sets of protein structure data determined by X-ray diffraction; and 2) the newly available (1968) molecular graphics display, the Brookhaven RAster Display (BRAD), to visualize these protein structures in 3-D. In 1969, with the sponsorship of Walter Hamilton at the Brookhaven National Laboratory, Edgar Meyer (Texas A&M University) began to write software to store atomic coordinate files in a common format to make them available for geometric and graphical evaluation. By 1971, one of Meyer's programs, SEARCH, enabled researchers to remotely access information from the database to study protein structures offline. SEARCH was instrumental in enabling networking, thus marking the functional beginning of the PDB. The Protein Data Bank was announced in October 1971 in Nature New Biology as a joint venture between Cambridge Crystallographic Data Centre, UK and Brookhaven National Laboratory, USA. Upon Hamilton's death in 1973, Tom Koeztle took over direction of the PDB for the subsequent 20 years. In January 1994, Joel Sussman of Israel's Weizmann Institute of Science was appointed head of the PDB. In October 1998, the PDB was transferred to the Research Collaboratory for Structural Bioinformatics (RCSB); the transfer was completed in June 1999. The new director was Helen M. Berman of Rutgers University (one of the managing institutions of the RCSB, the other being the San Diego Supercomputer Center at UC San Diego). In 2003, with the formation of the wwPDB, the PDB became an international organization. The founding members are PDBe (Europe), RCSB (USA), and PDBj (Japan). The BMRB joined in 2006. Each of the four members of wwPDB can act as deposition, data processing and distribution centers for PDB data. The data processing refers to the fact that wwPDB staff review and annotate each submitted entry. The data are then automatically checked for plausibility (the source code for this validation software has been made available to the public at no charge). 120,052 structures in the PDB have a structure factor file. 9,734 structures have an NMR restraint file. 3,486 structures in the PDB have a chemical shifts file. The significance of the structure factor files, mentioned above, is that, for PDB structures determined by X-ray diffraction that have a structure file, the electron density map may be viewed. The data of such structures is stored on the "electron density server". 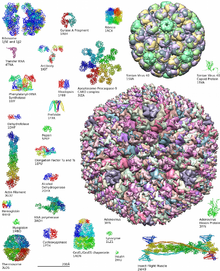 In the past, the number of structures in the PDB has grown at an approximately exponential rate, passing the 100 registered structures milestone in 1982, the 1,000 in 1993, the 10,000 in 1999, and the 100,000 in 2014. However, since 2007, the rate of accumulation of new protein structures appears to have plateaued. The structure files may be viewed using one of several free and open source computer programs, including Jmol, Pymol, VMD, and Rasmol. Other non-free, shareware programs include ICM-Browser, MDL Chime, UCSF Chimera, Swiss-PDB Viewer, StarBiochem (a Java-based interactive molecular viewer with integrated search of protein databank), Sirius, and VisProt3DS (a tool for Protein Visualization in 3D stereoscopic view in anaglyth and other modes), and Discovery Studio. The RCSB PDB website contains an extensive list of both free and commercial molecule visualization programs and web browser plugins. ^ a b EMBL-EBI. "PDBe home < Node < EMBL-EBI". www.pdbe.org. ^ a b "Protein Data Bank Japan - PDB Japan - PDBj". www.pdbj.org. ^ Bank, RCSB Protein Data. "RCSB PDB: Homepage". www.rcsb.org. ^ a b "BMRB - Biological Magnetic Resonance Bank". www.bmrb.wisc.edu. ^ Berman, H. M. (January 2008). "The Protein Data Bank: a historical perspective" (PDF). Acta Crystallographica Section A. A64 (1): 88–95. doi:10.1107/S0108767307035623. PMID 18156675. ^ Laskowski RA, Hutchinson EG, Michie AD, Wallace AC, Jones ML, Thornton JM (December 1997). "PDBsum: a Web-based database of summaries and analyses of all PDB structures". Trends Biochem. Sci. 22 (12): 488–90. doi:10.1016/S0968-0004(97)01140-7. PMID 9433130. ^ Meyer EF (1997). "The first years of the Protein Data Bank". Protein Science. Cambridge University Press. 6 (7): 1591–1597. doi:10.1002/pro.5560060724. PMC 2143743. PMID 9232661. ^ "Protein Data Bank". Nature New Biology. 1971. doi:10.1038/newbio233223b0. ^ Berman HM, Westbrook J, Feng Z, Gilliland G, Bhat TN, Weissig H, Shindyalov IN, Bourne PE (January 2000). "The Protein Data Bank". Nucleic Acids Res. 28 (1): 235–242. doi:10.1093/nar/28.1.235. PMC 102472. PMID 10592235. ^ "RCSB PDB Newsletter Archive". RCSB Protein Data Bank. ^ Curry E, Freitas A, O'Riáin S (2010). "The Role of Community-Driven Data Curation for Enterprises". In D. Wood (ed.). Linking Enterprise Data. Boston, MA: Springer US. pp. 25–47. ISBN 978-1-441-97664-2. ^ "PDB Validation Suite". sw-tools.pdb.org. ^ "PDB Current Holdings Breakdown". RCSB. ^ "The Uppsala Electron Density Server". Uppsala University. Retrieved 2013-04-06. ^ Kleywegt GJ, Harris MR, Zou JY, Taylor TC, Wählby A, Jones TA (Dec 2004). "The Uppsala Electron-Density Server". Acta Crystallogr D. 60 (Pt 12 Pt 1): 2240–2249. doi:10.1107/S0907444904013253. PMID 15572777. ^ Anon (2014). "Hard data: It has been no small feat for the Protein Data Bank to stay relevant for 100,000 structures". Nature. 509 (7500): 260. doi:10.1038/509260a. PMID 24834514. ^ "Content Growth Report". RCSB PDB. Retrieved 2013-04-06. ^ wwPDB.org. "wwPDB: 2013 News". wwpdb.org. ^ Westbrook J, Ito N, Nakamura H, Henrick K, Berman HM (April 2005). "PDBML: the representation of archival macromolecular structure data in XML" (PDF). Bioinformatics. 21 (7): 988–992. doi:10.1093/bioinformatics/bti082. PMID 15509603. ^ "ICM-Browser". Molsoft L.L.C. Retrieved 2013-04-06. ^ "Swiss PDB Viewer". Swiss Institute of Bioinformatics. Retrieved 2013-04-06. ^ "STAR: Biochem - Home". web.mit.edu. ^ "VisProt3DS". Molecular Systems Ltd. Retrieved 2013-04-06. PDBsum Home Page — Extracts data from other databases about PDB structures.